Designed to kill tumors, microbeams spare surrounding tissue. We can always kill cancer cells, says medical physicist Sha Chang. Always. It doesn’t matter where the tumor is. The problem, of course, is that what kills the tumor can also kill the patient. Chang has spent 15 years trying to perfect external-beam radiation therapy—changing dosages, adjusting the angle of the beam—and she knows all too well that she’ll never get it right. The radiation will always damage healthy tissue. thin x-ray microbeams, harming so little of the surrounding tissue that the body would barely notice. No one’s been doing this because no one had equipment that could produce the microbeams. Now, Chang and her colleagues have built a machine that can do it—and that they think may one day replace the radiation we use to destroy cancer. Chang works mostly behind the scenes; she isn’t a medical doctor, and she doesn’t normally see patients. But one she did meet sticks in her mind. “She was a woman in her thirties,” Chang says. “I volunteered to be her translator.” The woman came to UNC with an aggressive brain tumor. She had a standard course of treatment: surgery followed by radiation therapy that aimed x-rays at her brain to try to kill what was left of the tumor. The last step was chemotherapy. “The tumor disappeared,” Chang says. “She was very happy, of course. Brain cancers are some of the hardest to treat, because no matter which way you aim radiation, it must pass through healthy brain tissue to get to the tumor. For many patients, the maximum radiation their brains can handle isn’t enough to eradicate the cancer. Doctors have reached a plateau, Chang says, in their ability to help brain-cancer patients. Years ago, Chang read about a different kind of radiation therapy—microbeam radiation produced by powerful particle accelerators called synchrotrons. When a synchrotron moves electrons at close to the speed of light, it can produce x-ray radiation thousands of times stronger than the beams that radiation oncologists currently use to treat cancer. Back in the 1960s, scientists focused this powerful radiation into extremely thin, parallel beams and aimed them at the brains of mice. They found that these microbeams don’t seem to damage brain tissue, even at doses much higher than what cancer patients receive in therapy. Not until the dose got up to more than 100 times the therapeutic dose did the mice start to show signs of brain damage. Why don’t microbeams hurt the brain? Unlike x-ray beams used today, which might be several centimeters in diameter, these synchrotron-generated microbeams are a tenth of a millimeter wide. The beams are spaced apart, leaving gaps in between to spare healthy tissue while hitting the tumor in multiple places. The brain can shrug off the damage from those thin beams like it’s nothing. 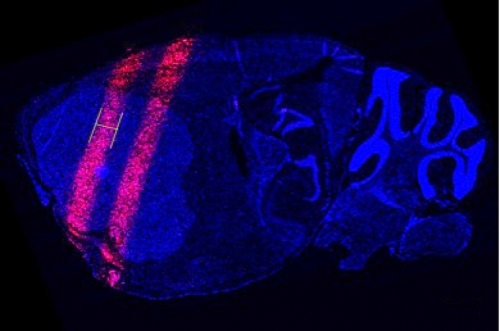 But tumors can’t, as scientists found in later studies of small animals with brain tumors. Maybe the microbeams work because the radiation slices up the tumor’s complicated network of blood vessels. Or it might be that cancer cells exposed to intense radiation somehow trigger the deaths of other cancer cells through intercellular signals, Chang says. 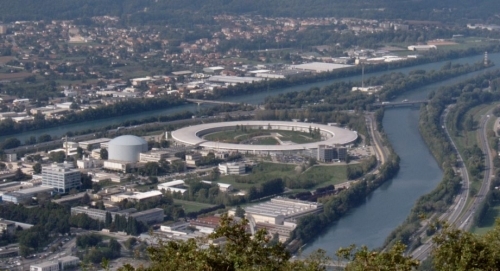 Wikimedia Commons The circle in this photo houses a synchrotron (the European Synchrotron Radiation Facility in France). Most cancer researchers, she’s found, haven’t even heard of microbeam radiation. They probably won’t hear about it, she says, as long as it can be studied at only two places in the world—one synchrotron at Brookhaven National Laboratory, and another at a facility in France. Normal radiation equipment found at top-of-the-line cancer facilities like Lineberger can’t produce microbeam radiation. But now something else can. Back in the 1990s, a UNC materials scientist named Otto Zhou got tired of his x-ray equipment burning out and breaking down. 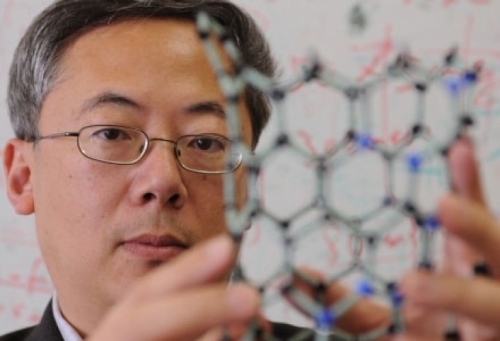 This was in the early years of nanotechnology research, and he and another UNC physicist, Jianping Lu, came up with a design for a new x-ray machine based on carbon nanotubes, tiny structures used for a variety of purposes because they’re good for conducting electricity. Since then, Zhou and his collaborators have improved the technology and adapted it to make smaller, more portable CT scanners and a new kind of breast-imaging device being tested at Lineberger. One other important feature of carbon nanotubes: they can produce microbeams. Unlike traditional x-ray beams that spread out as they move away from the source, microbeams stay narrowly focused on the target, passing through less tissue in the process. Of course, Zhou’s small x-ray machines can’t match the power of a quarter-mile-wide synchrotron. Microbeams aren’t useful if they can’t deliver a hefty dose of radiation. But, Zhou says, one day over lunch—after many lunches, Chang amends—they figured out how the single, powerful beam made by a synchrotron could be replaced by several weaker microbeams all aimed at a tumor. That, Zhou’s carbon nanotubes can do. “Traditional x-rays come from one point,” Zhou says. “With carbon nanotubes, we can make linear arrays of x-rays, or squares, or basically any shape you want. So their team built a device unlike any that’s ever been used in radiation therapy. Like a synchrotron, it delivers simultaneous, ultrathin beams of radiation with a small gap in between to spare healthy tissue. They’ve shown that it damages cancer cells in mice, the same way standard radiation treatment does. And like synchrotron radiation, the device packs a powerful punch. But it does so gradually, taking perhaps 20 or 30 minutes to deliver a dose of radiation that a synchrotron puts out in a fraction of a second. The synchrotron’s amazing power is probably one reason why cancer researchers haven’t looked more deeply into microbeam radiation, Chang says. It’s scary to think about aiming that much radiation at a patient, knowing that if you don’t cut off the beam just in time, the patient will get too high a dose. Zhou’s microbeam emitter delivers the radiation slowly. To make sure the beam doesn’t go the wrong way when the patient (in this case, a mouse) shifts around during treatment, the device takes an x-ray image of the brain while it works. It only fires the beam when the tumor is in exactly the right spot. UNC was just granted a patent for the device, which uses an x-ray source built by Zhou’s Research Triangle Park company, XinRay Systems. Zhou wants to make the device commercially available once he has a second-generation model. Their next step is to try to up the power of the microbeams a bit, in order to decrease the time a treatment takes. They want to figure out how many microbeams are best to use and the optimal dosage to wipe out a tumor. Mice, rats, and other small animals in studies of synchrotron microbeams have lived up to 10 times longer than animals treated with standard radiation. Chang hopes they’ll start to test microbeam radiation on humans by 2020, or not long after. If she found out she had an incurable brain tumor, Chang says, “I want microbeam radiation. 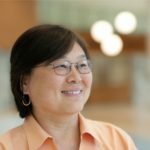 X. Sha Chang is an associate professor and head of the Physics and Computing Division in the Department of Radiation Oncology at the UNC School of Medicine. Otto Zhou is the David Godschalk Distinguished Professor in the Department of Physics and Astronomy in the College of Arts and Sciences. Both are members of the UNC Lineberger Comprehensive Cancer Center. Zhou’s Research Triangle Park companies Xintek, Inc., and XinRay Systems develop carbon-nanotube technology for applications such as information display, medical imaging, and microscopy.